I just wanted to introduce one of my favourite convenience store snacks. If you’re anything like me, you’ll go through certain days where you really crave something, and you have to have it, no matter what. Sometimes it’s stodgy or sweet, and nothing but cake will do; sometimes it’s salty or crunchy, and nothing but crisps or Jagariko will satisfy it; and more often than not, I am a biscuit monster. But occasionally, it just has to be gummy sweets, especially the sour ones. 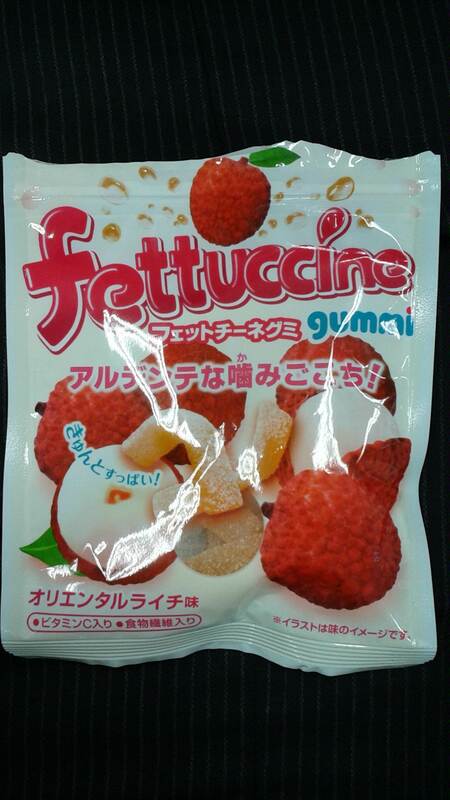 One of my favourite brands of gummy sweets in Japan is Fettuccine Gummi. They’ve got all sorts of flavours, like peach, lemon, grape, grapefruit, kiwi, apple, blackcurrant, and their most recent offering, oriental lychee. I’m a sucker for new flavours, and when I saw this one, I just had to try it out. If you like lychee flavoured products, chances are you’ll enjoy it. 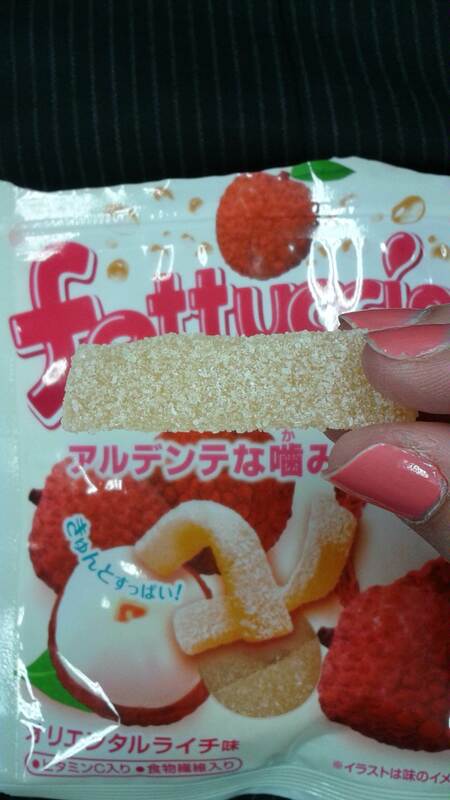 It was nice and sour, and squidgy, and full of gummy goodness galore. I liked it! I wouldn’t say it was my favourite, but it was pretty yummy. With a name like “Fettuccine,” you’d expect them to be quite long (wouldn’t you? ), but they’re really not. I’m sure you’ve caught on by now that I’m an incorrigible snacker, but why pass up all the good things in life, right? P.S. – I must apologise for the state of the packaging – I tore into it wildly before thinking, “Oh! I should take a photo!” And I must also apologise for the sorry state of my chipped nails as well. Feel free to pretend they’re freshly painted. Ha ha I’ve never thought of that before, but I guess lychees do look kind of creepy 🙂 They’re so sweet and delicious though! I want a snack NOW. But I have a broken foot, and there’s no sweetsoursquidinesscoveredwithsweetandsoursugarypowder at home. Oh wow. Now I want that. But your pictures will have to suffice 😉 I have to say, I’ve never been to Japan and when I think of it, snacks are not the first thing that comes to mind, but your posts are SO COOL and interesting! Going through all of them now. Oh no! I’m so sorry to hear about your poorly foot 😦 I hope it heals soon. You’re right. Snacks really aren’t associated with Japan at all, but they are so good! I have rarely eaten anything I haven’t liked. Thank you 🙂 It’s healing, but it’s a super complicated fracture (of course. It’s me and my luck.) so it’s healing slowly. Your blog is like a never ending visual supply of crazy sweets, love it! Thank you, same here, following and waiting for more! I am obsessed with lychee; it’s so abundant in Southern China and I miss it everytime I’m go back to the States :(. Have you ever tried the canned stuff? I used the syrup, mixed it with Midori and lime juice and garnished it with a lychee–lycheetini indeed! I can NOT believe this!!! I love fettuccine and my favorite was the kiwi flavor but the next summer when I went to get it I couldn’t find it and I thought I imagined this flavor but I am so happy you can confirm that kiwi was a flavor! Thanks for your comment 🙂 Yes it’s quite strange – it seems like sometimes they create a flavour and then you never see it again, or maybe you do.